This is a page about editing credits using the credits editor. It can be a bit finicky, and I (Nodever2) was asked to put what I learned about it here. I am by no means an expert on the credits, so feel free to add to this page if you learn more! The bulk of the stuff I learned will be at the end of the document, so even if you've already used the credits editor, I highly reccomend checking out the last section of this article, “How to NOT Destroy Your Credits”. First things first, I can refer you to this document if you want to learn more about credits editing in general. As of now, this wiki page will only contain some basic tips on actually using the credits editor. The Credits Editor in SMILE RF can be accessed by navigating to Tools > Special Editors > Ending Credits Editor. This document was written for the editor in SMILE RF. If you want to edit names from the credits, it's quite easy. Simple right-click a tile from the Credits Tile Table, and it will show up in Box #4 when selected. Then, click in a line in the Credits Tilemap Editor to place it on a line there. Note that the credits are broken up into individual lines. I'm assuming the purpose of editing the credits is adding your own, but there isn't a lot of extra lines in the Credits Tilemap Editor to work with. However, it is disrespectful to remove the names of the Nintendo staff, so I don't recommend doing that. 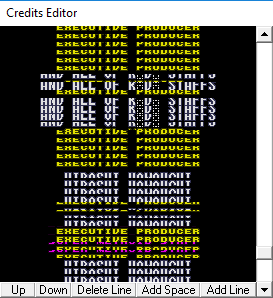 One possible workaround to this problem is to remove the headings from the credits in the credits tilemap editor (examples of headings: PRODUCER, PROGRAM DIRECTOR, etc. ), and then use those lines for your own credits. If you don't have a ton of credits, this will work. if your hack is large enough to need even more lines, then you'll have to do some more advanced editing which is beyond the scope of this tutorial. After preparing the lines you want to place/move around, you're ready to move on to the left window (Credits Line Arranger). Navigating this window is tricky at first. Here's the basics: You navigate this window by selecting and moving entire lines at a time. Right-click anywhere in this window to select a line, and then use the controls below to edit it. It's that simple! However, there are many pitfalls which you must be careful to avoid, as discussed in the next section…..
MAKE ROM BACKUPS FREQUENTLY!!! There's a good chance you'll need them, even after reading this. The credits are very finicky, not to mention how the credits editor likes to crash SMILE. Make sure all other level data edits, etc. are saved too. Edit the contents of each the Credits Tilemap Editor (box on the right) SEPARATELY from editing the Credits Line Arranger(box on the left); when changing from one to the other, always save the Line Arranger and re-open the editor. Failure to do this can result in the credits editor spontaneously reverting your changes back to the last time you saved - which may mean a lot of lost progress. Sometimes, when you exit and re-open the credits editor, you'll notice that the credits have been changed - typically, you'll see the vanilla bottom section of the credits repeated there, even though you didn't place it [to-do: find out why this happens and how to reproduce consistently]. However, as long as the glitch seen in the next bullet point below doesn't occur, you should be safe (probably? make backups often just in case) to delete the extra stuff that appeared there and replace it with your intended credits. Because of this, when you're done editing your credits, re-open the editor one last time to make sure this glitch didn't occur. Pure speculation: This may happen when your credits are shorter than that of vanilla, and the game fills all the extra space with these credits to restore it to it's vanilla length. Some twisted combination of these bugs can cause another bug where SMILE to crashes every time you try to save the credits. If this happens, from what I've seen, your copy of SMILE RF is fine - it's the specific ROM that is causing this. The crash randomly stopped happening to me after I saved the credits of a different ROM, strangely enough.